Pasta tossed with zucchini, cauliflower, olives, tomatoes, pepperoni, cheese, and Italian dressing; let chill a few hours before serving. Delish! 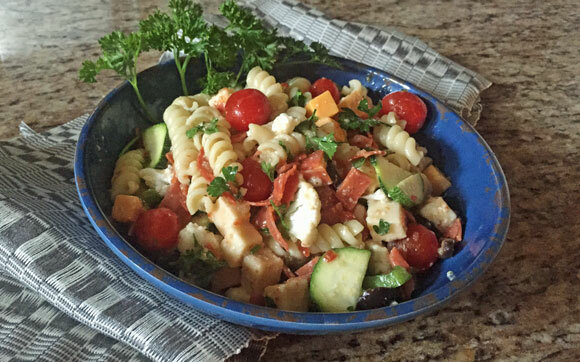 In a bowl toss together pasta, cubed cheese, salami or pepperoni, cauliflower, zucchini, peppers, onion, olives, Parmesan cheese & parsley. Pour Italian salad dressing (to taste) over all to coat and toss well. Cover; chill 4 to 24 hours. To serve, add tomatoes; toss gently. To make dressing yourself, combine 1/2 cup olive oil or salad oil with 1/4 cup wine vinegar, 2 cloves minced garlic, 2 teaspoons crushed dried basil, 1 teaspoon crushed dried oregano, and 1/2 teaspoon pepper; cover and shake well to combine. Other ingredients can be prepped while the noodles are cooking; all done about the same time, then toss and put in the fridge. Super easy.